A musical based on the Titanic is surely an ambitious undertaking - just like the ship itself - not only in its epic scale but in the competition with one of the most successful films of all time. This Broadway hit from 1997, with book by Peter Stone and music from Maury Yeston, is in danger of overreaching. Through a grand opening, the ship itself is depicted as the "pride of mankind", an impossible feat of engineering that is still no match for the power of nature. Of course, we all know the outcome of the Titanic's maiden voyage to America (here saccharinely positioned as a promised land of opportunity), so the focus is placed on the relationships between the passengers. Paralleling the layers of the ship, the characters are distinctly divided by class, though director Thom Southerland's clean and minimal staging cleverly blurs the boundaries that society so strictly enforces. The script is drenched in dramatic irony, allowing for some moments of humour before the tragic conclusion. However, the show suffers from a lack of focus in the narrative. Between the multiple characters in each class (based on real passengers), the captain and the crew, the characters are altogether underdeveloped. It leaves the audiences questioning: whose story is this? Is this the story of a megalomaniac corporation (headed by Ismay) pushing the limits of human engineering, a story of class struggles, a story of human bravery and love, or all three? With the narrative spread so thinly, the inevitable deaths lack emotional impact, leaving the second act drowning in sentimentality (though, owing to the subject matter, this is somewhat inescapable). It's testament to the music and the cast, therefore, that this revival remains such a resounding success. Yeston's string-based score is sumptuous, utilising folk melodies and instrumental effects to subtly evoke the movement of the ship and the elements. What's more, the powerful ensemble singing is the real engine room of the show. In such an intimate venue, the full force of the chorus hits you like the colossal iceberg, though there are plenty of opportunity for solo singing - in particular some wonderfully touching performances from James Austen-Murray and Victoria Serra. As the finale brings the show full circle, the ensemble leaves us singing "sail on Titanic". And so it shall - surely this human tragedy will continue to provide storytelling material for years to come. 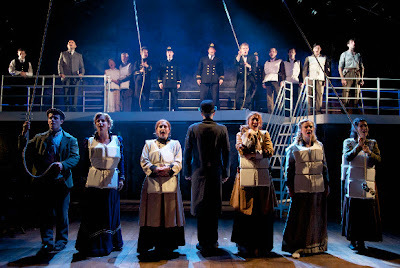 Stone and Yeston's musical may not be a tearjerker of James Cameron proportions, but thanks to its stunning score and the talented cast, this production remains a poignant musical drama. Watch: Titanic runs at the Southwark Playhouse until the 31st August.